This is so cute almost like targets lego dog last year! Already like you on facebook ! Thanks! Love this card! It’s too cute! Too cute! Looks like it would be a lot of fun x2! I hope I win! This is totally cute! me..me ..pick me.. I love cheese n live in Wi!! Go packers! Already Like you on Facebook. Thanks. Yay for a free target card! Thanks for this Gift card!!!! Love this site!!! Already ”LIKE” Totally Target on FB!!!! Like TT on facebook. Hope I win!! This is such a Merry giftcard! Fingers crossed!! 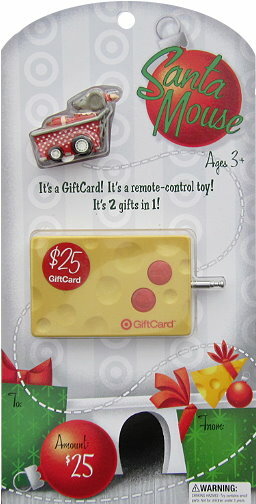 What a super cute gift card – thanks for the chance to win! This mouse wants her cheese for Christmas! How fun! We love gift cards! This is the cutest one yet, thanks! Would love to win this WOW!!! This is too cute, I so want to win this. Thanks for all you do and for the giveaway too! I’m in for another giftcard giveaway! Love Target and your blog! Thanks for helping us save money!